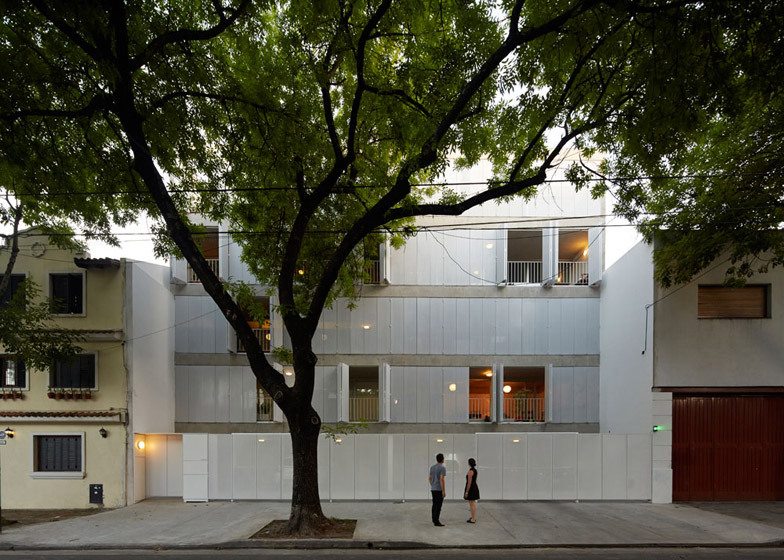 Perforated metal shutters give this Buenos Aires apartment building by Esteban-Tannenbaum Architects an ever-changing facade (+ slideshow). 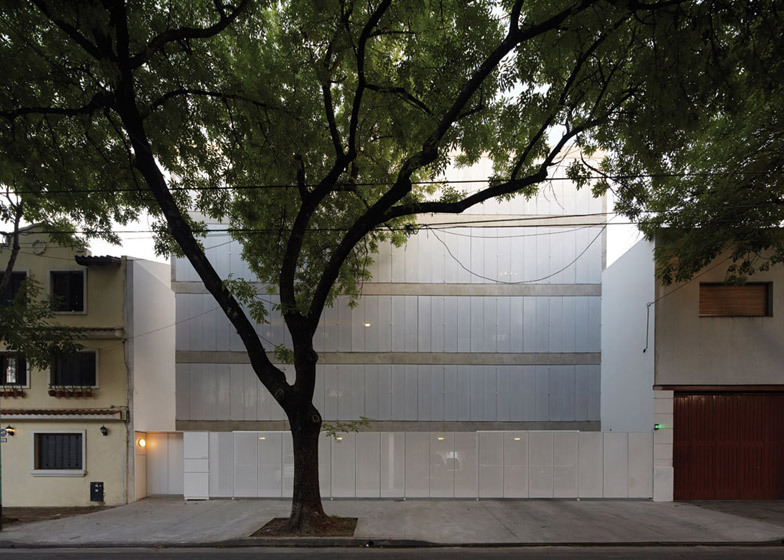 Known as Sucre 4444, the building was designed by Buenos Aires studio Esteban-Tannenbaum Architects with shutters covering the width of the street-facing apartments, offering privacy without blocking daylight. "Each occupant chooses their own relationship between light and privacy in their apartment," architect Romina Tannenbaum told Dezeen. 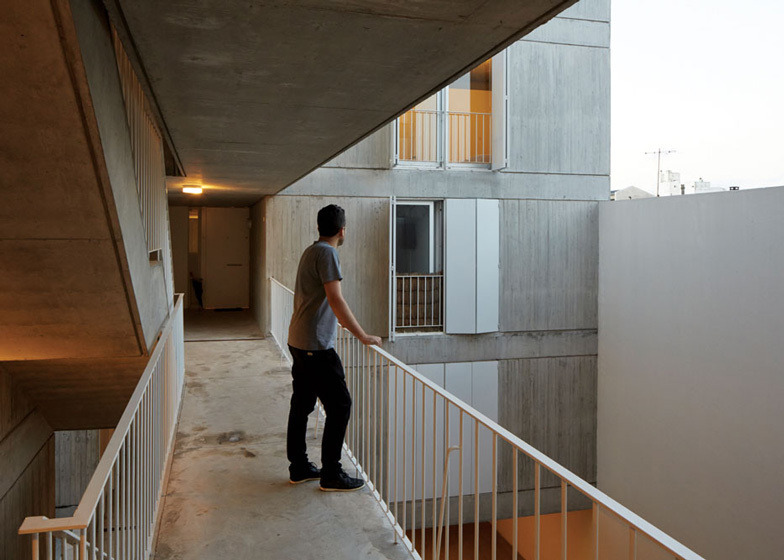 "We refer to this relationship as one of dynamic uniformity, because from the inside and outside, each inhabitant can give the apartment its own personality." The five-storey building features 16 apartments and was commissioned by a group of people who created a trust fund to pay for the construction. "Half the investors were looking for their first home – mostly young couples wanting luminous and ample spaces. The other half wanted smaller apartments that could be rented, either as housing or offices," explained Tannenbaum. Esteban-Tannenbaum took on the role of developer, providing the design and overseeing the construction and budget. "Under this kind of self-build model, architects gain a lot of freedom in the design but a lot of responsibility as well. We had to manage issues such as time limits, business plans, and a tight construction budget," said Tannenbaum. 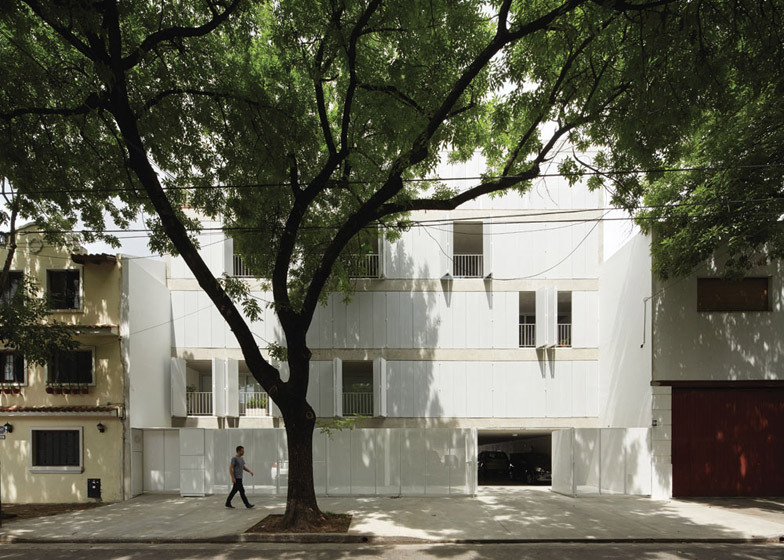 The building is located in the low-density neighbourhood of Villa Urquiza, and is set back three metres from the line of neighbouring buildings to make room for the branches of an existing tree, and minimise the building's visual impact. 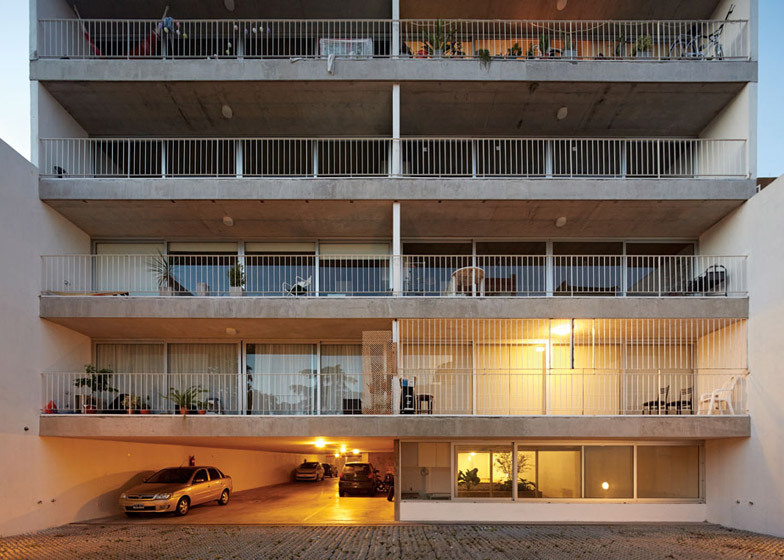 The 16 apartments are spread across two blocks – one at the front and one at the back – which are linked by open-air circulation space in the middle. The ground floor houses parking for cars and has two small gardens at either side of the stairs. The four floors above have four apartments each, while the roof accommodates two enclosed terraces. Half the apartments have two bedrooms and bathrooms, and the others have one bedroom and bathroom, but all have floor-to-ceiling storage units concentrated in the hallways. Balconies have been designed to mirror the proportions of the living rooms, allowing the residents to merge indoor and outdoor space for most of the year. "We attempted to duplicate the inside space with the exterior in order to create a close relationship between both spaces," said Tannenbaum. "The warm weather of Buenos Aires makes it possible to integrate the inside with the outside for almost 10 months a year." The building was constructed from reinforced concrete, which was chosen to give it a neutral appearance. 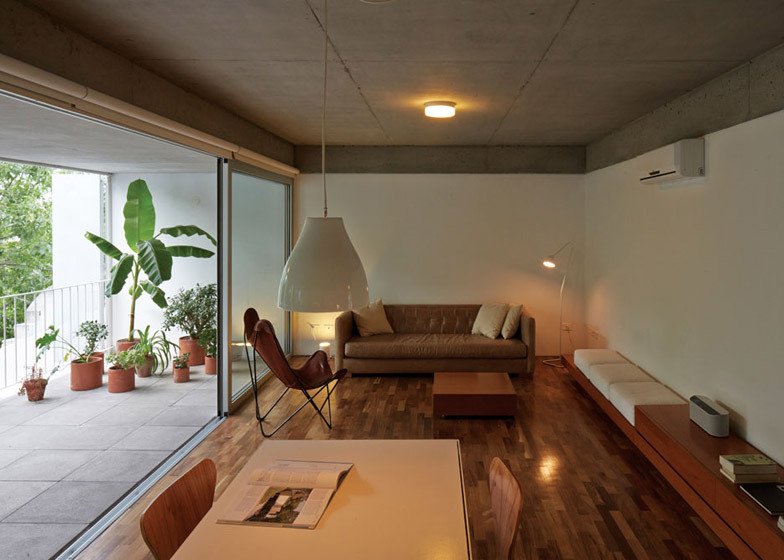 The concrete was left exposed on the ceilings inside the apartments, contrasting with warmer-looking timber flooring. "We tried to achieve austerity and neutrality through the concrete exterior, and also made a conscious decision to show the structure," said Tannenbaum. "Inside, this impact is decreased by the wood and the green from the tree outside." Bedrooms sit at the back of the apartments, overlooking the circulation area in the centre of the building, and feature solid shutters to block out sunlight. All images are copyright Cristobal Palma and used with permission.